UNITED NATIONS, February 27 -- In Turkmenistan under the just-ended rule of President for Life Saparmurat Niyazov, no political opposition was allowed. In September 2006, journalist Ogulsapar Muradova was tortured to death while in state detention. Children were allowed to read only one book in school, Niyazov's own tome, Ruhnama. 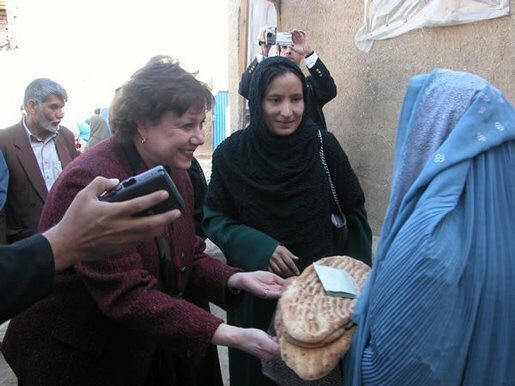 Nevertheless, in December 2006 just before Niyazov unexpectedly died, the country representative of the UN Children's Fund, Mahboob Sharif, was quoted that "Turkmenistan, being the active and consistent partner of UNICEF, has made significant progress in such important sphere as ensuring the rights and defending the interests of children." In light of the government of Turkmenistan's denial to children of the most basic educational and other rights and interests, Inner City Press inquired last month with UNICEF regarding its programs and policies in the country, including the role of the government in selecting UNICEF's staff. Four weeks after the request, UNICEF stated that it has been active in the country since 1992, and now has 18 staff members, three of whom are "internationally recruited professionals." Since unlike UNICEF's response about Zimbabwe, this did not describe the governmental role, Inner City Press followed-up. 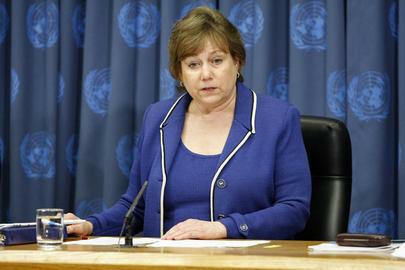 UNICEF responded that no, it accepts no "seconded" staff (staff dictated or suggested by the government). But Inner City Press' sources, who have worked at UNICEF in Turkmenistan, disagree. They describe a situation in which the resumes of prospective UNICEF hires are reviewed by the government, including the Ministry of Health -- not for the quantity or quality of health-related experience, but to check for any involvement in politics, human rights or journalism. Thereafter, the government is involved in selecting local hires as well. Last month new Secretary-General Ban Ki-moon called for audits of UN funds and programs in countries where independence of hiring, and payment in hard currency, might be issues. UNICEF was named by the Secretariat as one of the relevant UN funds. It now appears that North Korea is not the only (human rights-challenged) country in which there is a lack of independence in hiring. While still at an early stage, this inquiry into UNICEF's close relations with regimes widely described as despotic raises questions about where UNICEF would draw the line. In Zimbabwe, in the laudable name of helping orphans, UNICEF has partnered with the teetering Robert Mugabe government. Click here for that Inner City Press story. Earlier this month, UNICEF issued a joint press release with the government, quoting Lancaster Museka, a Mugabe minister who is the one responsible for justifying the beating of peaceful protesters in the streets of Harare, and for the closing down of non-governmental and human rights organizations. Is this particular partnership, this joint press release, necessary? While UNICEF may think it is unreasonable to expect a response from a person listed on an agency press release in less than 10 or even three days, such are deadlines. Whatever explanation of due diligence done before the joint press release is received will be reported on this site. In the case of Turkmenistan, was public praise of the dictator Turkmenbashi necessary in order to have any access to the country? Incoming president Gurbanguly Berdymukhammedov, elected with a whopping 89% of the vote, took his oath of office with his hand on Ruhnama. Sources who have worked at UNICEF in Turkmenistan indicate that country officer Mahboob Sharif has been there long, "probably too long," one said. On the other hand, inquiries have begun into previous UNICEF country officers in Azerbaijan -- a question is pending, regarding Akif Saatcioglu -- and the Maldives. Ultimately, however, leadership and answers must come from the top. Because a number of Inner City Press' UN sources go out of their way to express commitment to serving the poor, and while it should be unnecessary, Inner City Press is compelled to conclude this installment in a necessarily-ongoing series by saluting the goals and many accomplishment of UNICEF and the vast majority of its staff. Keep those cards, letters and emails coming, and phone calls too, we apologize for any phone tag, but please continue trying, and keep the information flowing. UNITED NATIONS, February 26 -- When does foreign aid serve to prop up a dictatorship? This question was raised earlier this year at the Executive Board meetings of the UN Development Program, concerning UN aid in North Korea. But the question appears to similarly arise in the wake of an announcements Friday and earlier this month concerning expanded programs in Robert Mugabe's Zimbabwe by the UN Children's Fund, UNICEF. Mugabe's long descent from participant in the Zimbabwean independence struggle to dictator is widely known, certainly to the senior leadership of UNICEF. The UN commissioned a report by Anna Kajumulo Tibaijuka, head of the UN's Nairobi hub, on Mugabe's mass eviction in 2005 of 700,000 perceived political opponents, called Operation Muarambatsvina / Take Out the Trash (or, "Drive Out the Filth"). Virtually none of the families evicted were re-housed, according to follow-up reports. When the Mugabe government controlled newspaper The Herald wrote its story on the partnership with UNICEF, it used the Minister's full first name, Lancaster Museka, and quoted him that "My ministry, with the support from the monitoring and evaluation sub-committee of the Working Party of Officials, is finalizing a comprehensive monitoring and evaluation system." "A few politically inclined individuals in the ZCTU leadership called for the said demonstration in collaboration with the oppositional political party (MDC) and other quasi-political organizations such as the Crisis in Zimbabwe Coalition and the National Constitutional Assembly. This demonstration was indeed meant to provide a litmus test to the proclaimed MDC policy of unleashing a "wave of demonstrations" in their bid to unconstitutionally remove the democratically elected Government of Zimbabwe. It is in this respect that the demonstration ceased to be a workers' activity and thus was subject to the laws of the land governing political demonstrations," said Museka. Zimbabwe's human rights groups and aid organizations are in increasing danger after the government threatened yesterday to use banning orders and arrests to force them to register with the state. The threat appeared in the state-controlled Sunday Mail newspaper, a week before laws controlling non-governmental organizations are due to be presented by President Robert Mugabe to the last session of parliament before a general election next March. All NGOs have had to be registered since 2002. But the Sunday Mail quoted Lancaster Museka, the permanent secretary in the welfare ministry, as saying: "Any organization found operating without registration will be closed and employees arrested." His statement followed threats from Paul Mangwana, the welfare minister, that there was "too much room for NGOs to engage in politics". The proposed law will make it illegal for hundreds of human rights groups and community organizations to continue to operate. So not only is this UNICEF "partnership with NGOs" limited to those NGOs which pledge support to Robert Mugabe and / or ZANU-PF -- also, UNICEF's main partner, quoted in UNICEF's own press release, is a Mugabe operative involved in shutting down monitors of human rights, including presumably of children's rights. Rights first? "A Swiss charity, Medair, on Tuesday said it was pulling out of the country after government refused to renew work permits for its expatriate staff. Medair communications officer Severine Flores told the Zimbabwe Independent: "We were a WFP implementing partner. We are disappointed at having to leave Zimbabwe at such a critical time. 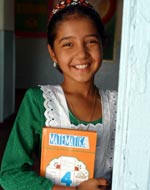 Medair provided up to 90,000 children in 150 schools with at least one daily meal. Very often it was the only meal they would get that day." Medair was banned from distributing World Food Program (WFP)-supplied food aid in August. The non-governmental organization (NGO) had applied for the renewal of work permits for its expatriate staff, but the applications were refused. Flores said they had received no explanation from the authorities. "We were just not desired to be there, regrettably," she said. It was not possible to obtain comment from the Ministry of Social Welfare, as the permanent secretary, Lancaster Museka, had not responded to written questions he requested from the Independent. Mr. Museka is not the only one not answering questions. On February 23, UNICEF and the German government announced a new $27 million program to assist orphans in Zimbabwe. Inner City Press that day approached Germany's permanent representative to the UN and asked about the press release and grant. "I haven't read the press release yet," he answered. A staffer from the German mission later called Inner City Press, but has not provided any substantive answer yet, 60 hours after the German Ambassador was asked. UNICEF employs 67 staff in Zimbabwe, comprised of 54 national and 13 international staff... UNICEF is the lead agency in Zimbabwe's response to an orphan crisis, reaching 100,000 OVC (orphans and vulnerable children) in 2006. In order to scale up the response for OVC and implement the National Action Plan (NAP) for OVC, a Programme of Support (PoS) for the NAP for OVC was developed. This PoS establishes a mechanism for donors to finance OVC interventions, with UNICEF serving as the manager for pooled donor funds and CSOs as the implementing partners. The PoS is based on a pooled fund mechanism, where donors contribute to a common basket where funds are directed straight to NGOs, in support of the NAP for OVC. ...Interested in your press release about the German government's contribution to assist UNICEF's work with orphans in Zimbabwe. That the work, and the contribution, are laudable goes without saying. But I wonder if you could comment on what steps UNICEF takes to ensure that its work does not prop up or help maintain the Robert Mugabe government, particularly at this time. What is behind the timing of this particular contribution? Also, any detail on the pooled fund mechanism, and the NGOs funded by it (and these NGOs, or some of these NGOs, relations with and/or opinion on the Mugabe government). How could you characterize relations between the Mugabe government and UNICEF in Zimbabwe? Is UNICEF concerned about the human rights and now ban-on-protest issues, and if so, does that concern lead to any actions? Any response you can send will be appreciated, as you're the contact listed on the press release. This was responded to 60 hours later, on January 26, with a request to wait an additional 10 days for responses. (The reason given is also laudable -- Mozambique -- but still, an agency's contact on a press release ought to be able to bring about a response to a release-triggered question in less than 60 hours, it would seem.) Inner City Press will run the responses when received. Certainly there are always balancing acts and trade-offs to be made. But they should not be swept under the carpet, they should be discussed, debated, explained. Developing. UNITED NATIONS, February 14 -- The UN Children's Fund today issued a report analyzing child well-being in rich, rather than only poor, countries. To its credit, and unlike other UN agencies like the UN Development Program, UNICEF acknowledges that the world cannot legitimately be divided into donor countries and recipient countries. In the UN's headquarters city, a child growing up in the Melrose Houses in the South Bronx, facing a daily gauntlet of muggers and bullies and drug dealers, is not so better off than a child in Brazil or Haiti. The study, Report Care 7 by UNICEF's Innocenti Research Center, ranks 21 rich countries in six "dimensions" of well-being for children. Not measured or compared in UNICEF's study "children's exposure to violence in the home both as victims and as witnesses." While the reason given for the omission -- essentially, lack of common definitions -- initially sounds reasonable, a study of well-being and family structure without regard to violence omits too much. The exclusion, due to "insufficient data," of Japan, Australia, Turkey and South Korea is also problematic. A sample of the interesting findings involve the Czech Republic, where reportedly only 50% of children say that their peers are "kind and helpful." (What is the "common definition" of that, one wonders.) Compared to fewer than 30% in Finland, 45% of Czech children report having been involved in fighting in the past 12 months. While UNICEF's stated embargo on the study, which Inner City Press is respecting, was 10 a.m. GMT, 3 a.m. U.S. Eastern time, the embargo was widely broken. A British NGO went online sixteen hours early; BBC followed, nine hours before the embargo time. The Unicef study concludes that "the United Kingdom and the United States find themselves in the bottom third of the ranking for five of the six dimensions reviewed." In the era of George W. Bush, it is a conclusion of some courage, a courage not matched by the study's manner and mode of release, nor its approach to family structure. UNICEF's report not surprisingly valorized two-parent households over one-parent households. But it goes further, in also distinguishing "step-family structure." An accompanying small-type press release acknowledges that this "may seem unfair and insensitive." In a word, yes. And fetishizing the nuclear, straight, never-divorced family strikes some as a sop to right wingers everywhere, but especially in the United States. It should be noted -- but is not, in UNICEF's study -- that the U.S. remains a non-signatory of the Convention on the Rights of the Child. "all Unicef's programmatic and policy advisory work took place in the 'poor' world... although Unicef might fund research into child poverty in the 'rich world' -- and tentatively began to do so -- there was nowhere for Unicef to go with such research... If a rights perspective was superimposed on the poverty perspective, these problems fell away." But there still seem to be a problem with speaking truth to power. The U.S. release of the study is, by choice, a whimper and not a bang. UNICEF's Ann Veneman, so often available to the media when other agencies' studies are released, has not scheduled any press conference. On Tuesday Inner City Press asked the spokespeople of the U.S. and UK missions to the UN if they had any comment on the study; none was provided. Later, to the BBC, UK "Welfare Reform Minister Jim Murphy said the Unicef study was an 'historic' report, which used some data which was now out of date. 'It looks at some information and analysis from perhaps six, seven, eight years ago.'" February 6: The World Bank's Integrity Report mentions a referral made to UNICEF. This is a request for any information available about this referral. For comparison's sake, the World Bank report discusses categories of seeming irregularities looked-into, and descriptions of some. (The full name of the World Bank report, made public today, is the "Integrity Report of the World Bank Group, Fiscal Years 2005 - 2006"). Also, the recent report on Children and Armed Conflict in Sri Lanka says that UNICEF compiles and investigates complaints of abuse of children, including but now limited to recruitment into armed conflict, and maintains a database. In what other countries does UNICEF compile information on and maintain databases of child recruitment into armed conflict? For example, does UNICEF look into the recruitment of children in Brazil into armed conflict, in gangs or otherwise? What definition of "armed conflict" does UNICEF use? briefing, or only in Europe? From what we take to be the most recent publicly-available audit, A/61/5/Add.2, we note at page 60 that "in 2004, the Office of Internal Audit reviewed investigation issues reported by 11 country offices. It conducted three investigations itself." Can you state which were the 11 country offices reporting "investigation issues," and what these issues were? Also, where OIA conducted the above-referenced three investigations, and what OIA found? Page 60 continues that "UNICEF has not implemented the Board's recommendations to review its overall anti-fraud policies and tools," and the Audit at page 7 states that "during the biennium 2004-2005, UNICEF reported 42 cases of fraud or presumptive fraud to the Board (as against 37 in 2002-2003)." Can you described these cases of fraud or presumptive fraud, and what was done? cash assistance projects was also unsatisfactory." Have internal audits been conducted and if so, can copies or, separate request, summaries be provided? period, with no clause covering a rise in prices.... UNICEF failed to set up a consistent mechanism to follow up the implementation of the projects, monitor the work of the contractors and management the relationship with UNOPS." Please comment on this, including specifically on the fact that UNICEF's partner UNOPS has not timely filed its financial statements. The audit at 58 states that "The Internal Audit Committee is composed of 11 members, and has only one external member (the Director of the UNDP Officeof Audit and Performance Review)." If this refers to Jessie Rose Mabutas, given that she is leaving UNDP in mid-February, with whom will UNICEF replace this single external member, and what plans are there to increase external participation? These questions were posed on January 24, and then because of deadline were reiterated on January 26 and 27, then after that deadline on February 6, and again on February 13. And still, no answers. While UNICEF's 13th floor -- analogous to the Secretariat's 38th -- is known to be involved in the delay, it is not clear if Ann Veneman is aware. We'll see.